Each year, several awards are given for the best children’s’ books published during the previous year. The Caldecott Medal has been awarded annually since 1938 to the most distinguished illustrator of a children’s book during the preceding year. The Newbery Award has been awarded since 1921 to the author of the most distinguished contribution to children’s literature during the preceding year. The Laura Ingalls Wilder Medal is presented every three years to an author or illustrator who has, “made a substantial and lasting contribution to children’s literature.” NOTE: This award has been deleted by the American Library Association, as they feel that Laura Ingalls Wilder’s writings do not meet the ALA's “politically correct” standards of today. As prestigious as they are, do not let awards or medals dictate a choice in children’s books. Awards are given for the quality of the writing or the illustrations and do not guarantee that a book will be successful. The parent’s interest, good taste, and discretion should be the influencing factor in choosing a book. Welcome to the Children's Hour where reading to children and reading by children is considered a high priority to their success in life. Literacy begins by reading to children, but is developed over the years when great literature is available for their listening and reading enjoyment. The best children’s books contain imaginative stories, memorable characters, beautiful illustrations, and lyrical language. Well-written stories should contain heroes and role models to imitate. Great books should be enjoyable reads, make the world a better place, and incorporate heart, humor, and hope. 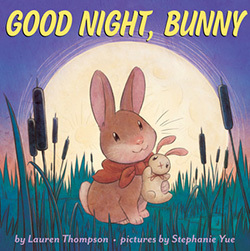 In the spirit of Goodnight, Moon (HarperCollins 1947), an adorable little rabbit winds down his day by saying goodnight to everything and everyone in his world. In rhyming text he includes swallows, pansies, spiders, dragonflies, ducklings, mice, cattails, minnows, breezes, stars, and his family. “Good night, brothers big and little. / Good night, sister snug in the middle. / Good night, ears and whiskery nose. / Good night, wiggly tickly toes.” Tucking in his stuffed bunny with kisses, hugs, and cuddling, it’s off to dreamland. 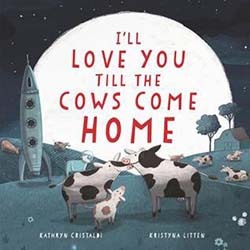 This sweet and comforting bedtime book, with its gorgeous illustrations that pay homage to the beauty of the natural world, makes for a great storytime read aloud for little ones. It’s a little known fact that “Elephants are happiest at bathtime,” “Iguanas sometimes get homesick on sleepovers,” and “Raccoons are always the first to arrive for a party.” In this charming alphabet book, Sara O’Leary presents quirky, charming, and hilarious one- line facts and habits of animals for each letter of the alphabet. In terms of animal behavior, some scenarios are silly, some are absurd, and others describe the wants and needs of little ones. 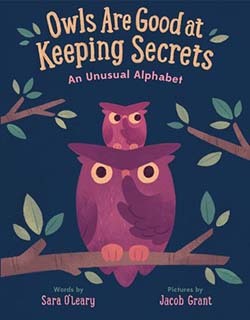 Like Bears, they, “want their mothers to kiss it better,” or like Chipmunks, they, “love to stay up past bedtime.” Owls may be great at keeping secrets, but kids will love spreading the news when they hear this whimsical and sweet alphabet book read to them. 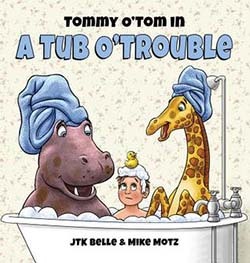 “Tommy O’Tom was taking a bath when in walked a hippo—and then a giraffe.” These wild animals join him in the bathtub along with a flamingo, zebra, and elephant, who discover surprising fun splashing, writing on the mirror, leaving mud tracks, dropping huge amounts of flamingo feathers everywhere, and turning on the shower to water the wallpaper flowers. While Tommy’s mother calls from beyond the door to hurry up, Hippo shouts, “Can you pass me the scrubber? Hey, this duck’s made of rubber! This sure beats the pond at the zoo!” When a shocked mom wants answers to the mess, Tommy uses his keen imagination for the answer. Kids will love the interesting bathtub, shocked expressions, and the just-for-fun adventure. 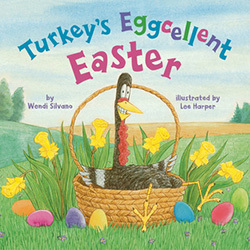 This latest entry in the Turkey Trouble series finds Turkey and his friends walking in the park, where they find a sign announcing an Easter Egg Hunt: “Find one of the ‘special’ eggs to win an eggstraspecial prize.” Unfortunately, the hunt is only for kids, but Sheep suggests, “If they don’t know we’re there, we won’t get the boot …” The friends disguise themselves with sunglasses, and Turkey goes undercover as a rabbit, a daffodil, and a bee. But the kids are quicker than Turkey at finding the eggs. Undaunted, the friends work together to design their own egg (with Turkey inside.) Find out how Turkey wins a prize of a huge jelly bean-topped pizza to share with his friends. Kids will enjoy the silly costumes and funny expressions in this holiday treat. 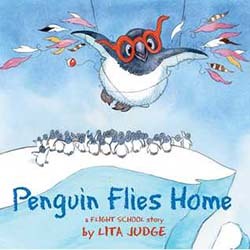 “Penguin loved everything about flying: the feel of the wind beneat.h his wings, the song that rose from his little round belly, the sight of new and wonderful places.” When he misses his penguin friends from the South Pole, with help from his flight school teachers, he returns to the Antarctic to share with the penguins all that he has learned. Surprisingly, they are unconvinced about the marvels of flying, and would rather soar under the water with their friend Whale. Realizing that his friends don’t share his passion for flying, Penguin treasures every moment with them, but decides to follow his heart and return with Teacher, Flamingo, and Egret. In this sweet follow-up to Flight School (Antheneum 2014), sometimes dreams are worth chasing, even if they aren’t considered normal. Life is pleasant under the sea in a coral reef, where the fish do their usual thing. “Spiny Lobster looks for a new home. Parrotfish crunches coral and poops sand... Lionfish does whatever she pleases.” The exception is Crab, who “bakes cakes,” until one night a boatload of junk is dumped into the ocean and the once clear water turns dark. 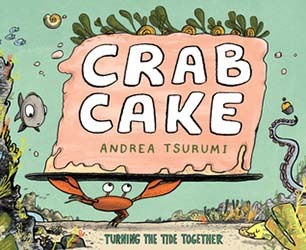 When the fish become afraid, confused, and dumfounded, Crab determines to carry on baking cakes, and they come out of hiding, are comforted, and find a solution to the pollution. In acts of defiance and resilience, the fish shove, roll, tow, drag, carry, and lug the trash back to the humans with a signs attached, “COME” “GET” ”YOUR” ”JUNK!” Kids and adults will like the messages of environmental pollution, teamwork, resilience, and the healing powers of yummy baking. Links are found in the end pages to NASA’s Climate Kids Ocean Resources. 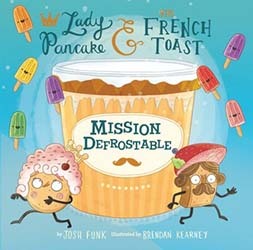 This third episode in the delightful Lady Pancake and Sir French Toast series finds the two sleuths re-uniting to help Agent Asparagus, with his Fridge Bureau of Investigation badge, to track down the villain, who has frozen the refrigerator. “‘Where are we going?’ asked Toast from the rear / ‘Up to the freezer, of course!’ said the spear. / Sneaking past peas in a snow paradise, / they sidestepped a pineapple dripping with ice.” When Agent Asparagus is kidnapped, they team up with an old enemy, Baron Von Waffle, who proves to be the hero of the day in a sweet ending full of courage, kindness, apologies, and forgiveness. Kids will love the facial expressions of the angry bananas, the conga-dancing popsicles, and the Peach Boys. Be sure to catch the first two hilarious tales, Lady Pancake and Sir French Toast (2015) and The Case of the Stinky Stench (2017). Sterling is a lonely, small dachshund in search of a forever family. When he spies the Butlery Cutlery Company sign advertising free “Shipping to All the Best Homes,” he hides in one of their boxes and waits to be delivered to his perfect home. Imagine the surprise of the Gilberts when they find Sterling in their fork box. Fearing that his new family will turn him out, he determines to become whatever they need—a fork, stick, chandelier, whisk, or lamp. 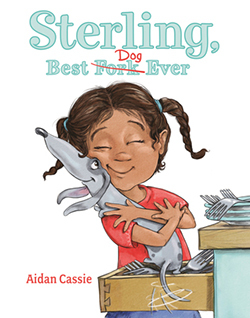 Fortunately, his new family patiently loves and accepts him, as he finally figures out what he needs to be—“the huggable, snuggable, perfectly lovable dog.” Kids will love all of Sterling’s shenanigans as he tries to fit in. Welcome to Centerburg, America where a young boy named Homer Price resides with his family, builds radio sets for fun, pumps gas at his father’s gas station, helps his mother clean the tourist cabins she manages, and tinkers with his uncle's new invention— an automatic donut maker. 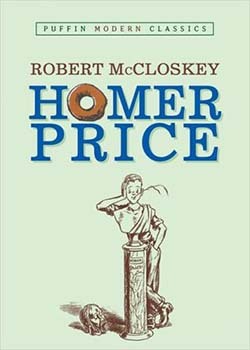 Readers will love Homer using his wits and pet skunk to catch bandits, a rampaging donut machine making hundreds of donuts with a lost diamond bracelet in one, a competition between his uncle and the sheriff involving a local widow and a ball of string, and a mysterious shaggy-looking stranger claiming he can rid the town of mice with a fancy musical machine. Written in 1943, this classic with its colorful townspeople, humorous events, and one clever and thoughtful boy from small-town America, make is a winner for the whole family. 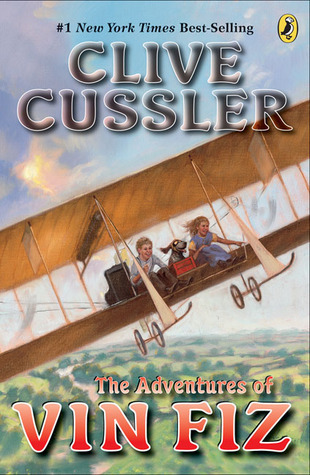 When Casey’s toy replica of the famous Wright Brothers’ Flyer becomes real, their journey to New York begins in the newly christened Vin Fiz, named after Casey’s favorite soda drink. 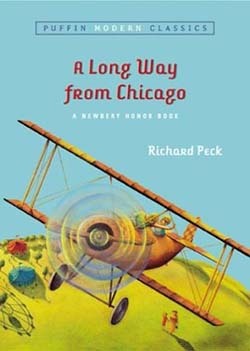 Under the guidance of an enchanted, intelligent, and responsive plane, the twins and their basset hound, Floopy, save a town from gold thieves in Nevada, warn a Mississippi River steamboat of a runaway barge headed their way, stop a runaway train in Ohio, and save two teenagers from plummeting over the Niagara Falls. Kids and parents will love the magical adventure, historical facts, character names, and surprise ending, as well as the sequel, The Adventures of Hotsy Totsy (2010). “The little old kitchen had quieted down from the bustle and confusion of midday; and now, with its afternoon manners on, presented a holiday aspect that, as the principal room in the brown house, it was eminently proper it should have.” At the turn of the nineteenth century, this was home to a widow and her five children who learn to cope with poverty, living near starvation, and illness with courage, devotion, and respect for their mother. Mary Pepper ekes out a meager living from sewing jobs, while her children Ben, Polly, Joel, David, and Phronsie take on adult responsibilities to keep the family together. A chance encounter with a wealthy boy and his dog changes their lives forever. 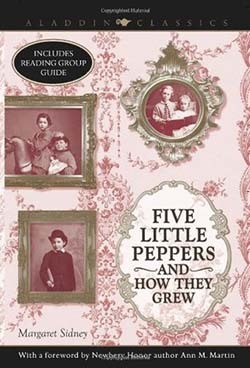 Although written in 1881, this story is a charming tribute to the best in people, especially families. “We live in a society exquisitely dependent on science and technology, in which hardly anyone knows anything about science and technology. 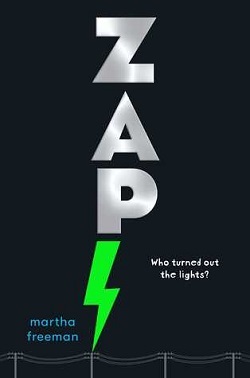 This is a clear prescription for disaster.” So begins a quote from Carl Sagan in this mystery/adventure story surrounding two tweens, a massive power outage, science and political connections, and computer coding.11-year-old Luis Cardenal is curious about how things work, and when the power goes out in Hampton, New Jersey, Luis and his friend Maura begin to investigate the ongoing blackout, rumors of terrorist attacks, and foreign intervention. When they accidentally overhear, “Zap seven forty-two,” from Maura’s grandfather, they begin a search for a homeless teen legend by the name of “Computer Genius.” and his connection to Maura’s grandfather. 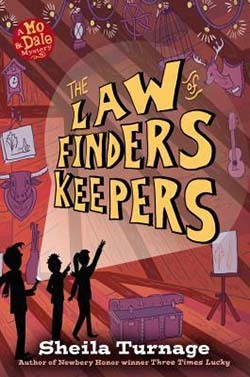 This fun mystery will appeal to reluctant readers with its fascinating science technology, engineering, and math concepts. Endpapers explain crank radios, solar cells, nuclear fission, AC power, the power grid, and assembling an emergency kit. In1849 cries of a Gold Rush echo across the country to Boston, where a young boy resides with his sisters and Aunt Arabella. When his aunt loses all her money, twelve-year-old Jack and the faithful family butler, Praiseworthy, sail to California to strike it rich to help her. These two unlikely gold miners/adventurers sail on the paddle wheeler, Lady Wilma, around South America’s Cape Horn and up to San Francisco. Along the way, they outwit thieves, survive vicious storms, save grape cuttings and barrels of spoiled potatoes, deal with an invasion of Peruvian cats, and help the ship’s captain to beat competing ships to San Francisco. There, they begin their trip to the Sacramento gold fields and encounter miners, outlaws, and varmints. To buy picks, shovels, horn spoons, and a hotel room, clever Praiseworthy cuts and keeps the miners’ hair and beards that contain gold dust. Surviving a stage coach robbery, they arrive at the diggings and begin panning for gold. 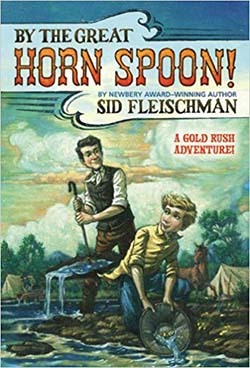 Written in 1963, this classic western adventure will give readers a taste of history, hilarious action, fascinating characters, clever plots, and the escapades of two tenacious heroes nicknamed Jamoka Jack and Bullwhip. 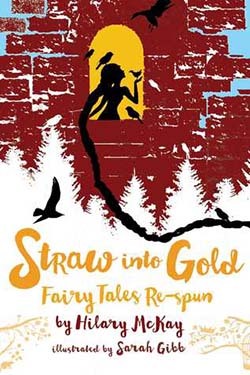 In this imaginative and clever retelling, Hillary McKay gives readers a fresh perspective and an unexpected journey into the fairy tale world. Narrated by grown up fairy tale characters, they share their stories, with a different slant, to a new generation. This fourth and final book of the Mo and Dale Mysteries series finds the Desperado Detectives, sixth graders Mo, Dale, and Harm, investigating pirate treasure fever in Tupelo Landing, North Carolina, while following new clues to Mo’s missing Upstream Mother. When a slick professional treasure hunter claims to know where Blackbeard’s lost gold is buried, the Desperados are hired by the mayor’s mother to search, as she claims to be the rightful owner. Mo’s ongoing search for her missing mother takes a surprising turn, when new clues emerge from the Colonel and Miss Lana. Of course, interference from Mo’s nemesis, Attila, is always expected, but with surprising results. Readers will enjoy Dale’s hilarious use of the English language, Valentine’s Day surprises, and pithy sayings (Nothing says I love you like an alibi; Never let your hopes rise higher than you can stand for them to fall.) Don’t miss the first three books: Three Times Lucky (2012), The Ghosts of Tupelo Landing (2014), and The Odds of Getting Even (2015). During the Depression years Joey (narrator) and his sister, Mary Alice learn lessons about life from their thrifty, hardworking, and shrewd grandmother in rural Illinois. Each chapter is devoted to the annual weeklong summer visit at Grandma Dowdel’s house at the end of town. Stretching the truth, plotting schemes to even scores, catching fish from a stolen boat, arranging an elopement, handling a teenage vandal, a drunk sheriff, and a wealthy banker, Grandma Dowdel teaches her grandchildren about life. Humor, good old-fashioned fun, impressive escapades, and colorful characters make this classic story unforgettable. When Elizabeth Rew’s social studies teacher recommends her for a job as a Page at The New-York Circulating Materials Repository, she discovers that it is unlike any library she's ever seen. Instead of books, the vast nine floor building is filled with historical objects and “special” collections, including magical objects in the Grimm Collection. Among the items collected by the Brothers Grimm in their travels and associated with their tales, are Aladdin’s carpet, Cinderella’s glass slippers, Snow White’s step-mother’s sinister mirror, and mermaid combs. When several magical objects begin to disappear, Elizabeth and her fellow pages embark on a perilous quest to apprehend the thief and avoid capture, only to become suspects. 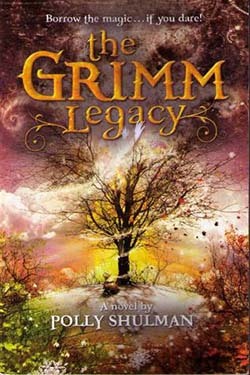 Teens will love this modern fantasy with its adventure, romance, magical intrigue, flying charms, and carpet rides. The Children's Hour was created to promote and encourage reading to children and by children. We believe that reading aloud not only creates a special bond between parents and children, but it is important to the development of their imagination and curiosity.